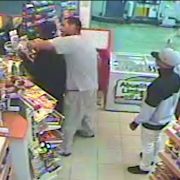 When this bystander walks into an armed robbery in progress, he decides not to let it be. That might not be the safest choice, but he certainly got the job done! If you value what we do at ASP, would you consider becoming an ASP Patron Member to support the work it takes to make the narrated videos like this bystander letting the robber have it? https://get-asp.com/patron gives the details. 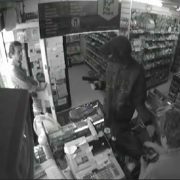 What does this video teach us about protecting ourselves against an armed robber? Transitional spaces are places where we MUST be more careful of potential attack. A transitional space is any location that (1) allows attackers to prey on potential victims with an element of surprise and (2) provides ready escape for the attackers. Convenience stores are all transitional spaces, and as potential bystanders to an armed robbery, it pays to look through the glass door before entering to make sure that the scene inside is safe! One of the factors we see in injury to victims of crime is half-hearted resistance or half-hearted compliance. This amounts to an ego check or a will check of the armed robber to see if they really mean what they say they mean, and while that’s normal for people to do, it gets a lot of people hurt. Either comply fully with the criminals’ demands, or resist with everything you have to overwhelm the attacker and end the threat. Don’t go half-way. 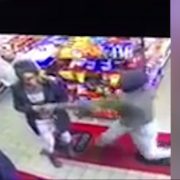 This bystander went full-bore against the armed robber, and that’s why he came out okay. 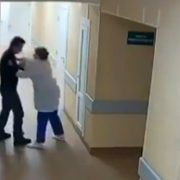 If you do not have the attitude, skills, and plan to protect yourself from an attacker, then your only option is to submit to their demands and hope it works out for the best. I would never suggest that a helpless person try to defend themselves against a carjacking or armed robbery, though of course if it’s a matter of life and death you must do whatever you can. The point, though, is not to be a helpless victim! 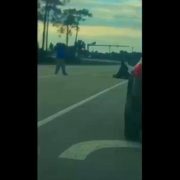 This is the heart of Active Self Protection, to motivate you to train and help you develop the attitude, skills, and plan so that you can choose to protect yourself if it makes sense in the moment rather than being forced into compliance with a violent felon. The clerk was compliant, and given her situation, that was probably her best choice. 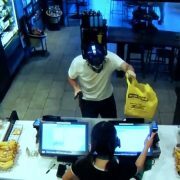 This is definitely one of the biggest lessons I have ever seen an armed robber get on camera, but it also teaches us about the line between self-defense and becoming an aggressor. If you value what we do at ASP, would you consider becoming an ASP Patron Member to support the work it takes to make the narrated videos like this educational beat down of an armed robber? https://get-asp.com/patron gives the details. 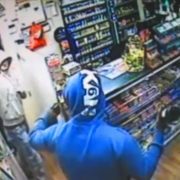 What does this video teach us about protecting ourselves from an armed robber? One of the things that we see in most places is what is known as an “educational beat down,” which is described very well by Rory Miller and also by Greg Ellifritz (with a second helping here). 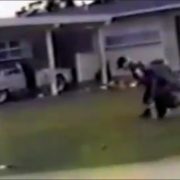 While among some groups and in some places the educational beat down is an expected part of keeping order (and I personally remember it happening in the construction industry I worked in as a teen in Sacramento, multiple times) we must remember as self-defenders that we defend ourselves and that’s it. We can’t be the bringers of punishment, and make no mistake an educational beat down is punishment. It will get you charged with assault or more serious charges, so restrain yourself and don’t give them! You must accept that danger exists and that it can happen to you. This is the foundational core of spiritual fitness and the first step in taking proactive steps to protect yourself and your loved ones. If you live in a fantasyland that nothing bad can happen because nothing bad has happened in the past, you’re setting yourself up for a terrible letdown. 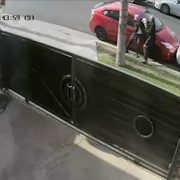 The bystander here clearly knew that danger existed in his world and he was CLEARLY ready to counter it when the armed robber launched his attack. The eyes may be the windows to the soul, but the hands are the windows to the intent of a person. If you’re in a potential conflict, ALWAYS pay attention to what the aggressor is doing with their hands. They might have a force multiplier in their hand, or they might be hiding their hand so that you can’t see what is in it or using their hand to conceal something. If their hands are empty, there is a difference between someone with fists and someone whose hands are open and relaxed. As a self-defender your situational awareness must include seeing the hands of any potential threat in your vicinity, so watch the hands! The armed robber was hiding his hands, and that was a big sign of trouble. Watch the hands! One of the factors we see in injury to victims of crime is half-hearted resistance or half-hearted compliance. This amounts to an ego check or a will check of the armed robber to see if they really mean what they say they mean, and while that’s normal for people to do, it gets a lot of people hurt. Either comply fully with the criminals’ demands, or resist with everything you have to overwhelm the attacker and end the threat. Don’t go half-way. At the very least I love that this bystander didn’t go half way!